Sweet Shades: Can Geo-Engineering Keep Earth Cool? Have you seen those aluminum light reflectors that go inside the front windshield of your car to keep the car from getting so hot in the summer? Pretty useful, even if they just keep your car a few degrees cooler. Well, scientists have essentially come up with a way to create something similar for the entire planet. Scientists believe they have found a way to utilize geo-engineering (basically manipulation of the planet’s environment) to counteract the warming expected if we maintain our current rate of carbon emissions. By injecting very small particles of sulfate into the upper atmosphere, we could deflect some of the sunlight coming towards Earth. Scientists estimate that if we block 2% of the sun’s incoming light, we could counteract the warming expected with the projected rise in atmospheric carbon from 390 parts per million (ppm) today to 560 ppm. Geo-engineering is a very interesting concept. I like that it attempts to proactively address the issue of rising global temperatures. But, it also appears to involve dramatic steps that could have many unknown consequences. We know that human actions can have unintended effects on the environment. We have wiped out species at an alarming rate, contaminated our air and water, and depleted many natural resources. 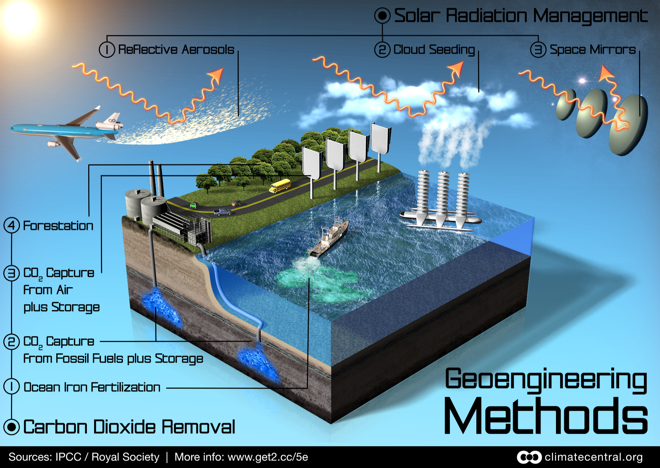 While each of the above geo-engineering methods has the good intention of combating climate change, we do not know what other consequences these methods may have on our ecosystem. One article reports that geo-engineering experiments have resulted in reduced rainfall. I believe we should explore our options for protecting the Earth against excessive warming, but I think that a great deal of additional research and testing is necessary before geo-engineering could be rolled out on any large scale.